Great things are happening at the BC Conference communications department. Joey Aguilar, the BC Conference communications director, saw his mandate for REACHing across the province and creating Alignment as a perfect opportunity for engaging and equipping the local churches and schools. Joey has been the Digital Media Production 12 teacher at Deer Lake School for the past nine years. Since joining the BC Conference, he had the vision to equip young people across the province to connect with their schools and churches using their media skills to promote local church and school activities. 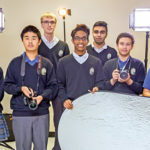 Joey, with the assistance of Otto Castillo and Paul Eun, is currently teaching the Digital Media Production 12 class at Deer Lake School in a face-to-face format where he is also recording and creating material for the online version for BC’s very own West Coast Adventist School. 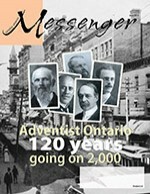 This is the first year this is being offered and currently Fraser Valley SDA School is attending the online version. This Digital Media class teaches the legal and ethical competencies for intellectual properties, basic graphic design, digital photography, videography, and audio recording. During digital photography, the students study the basics of manual DSL camera settings, frame composition, and editing software. They learn the concept of visual literacy to tell stories through their photographs. Their projects include creating material that will promote activities and events for their “clients,” the school, and/or local church. In videography the students learn the production process of storytelling using video. This includes how to create a storyline, scriptwriting, video camera techniques, and editing software. Their projects are to create and film their own values-based story as well as how to conduct and film an interview for documentary. The students learn the basic concepts of the audio-recording process by recording original talent from within their own school. 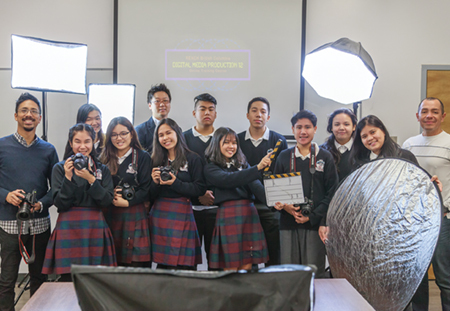 For their final project, the media students will consolidate their learning by creating an original music video that incorporates all the lessons they have learned to that point. How will this create Alignment, you ask? How will this help our local churches and schools? As these young people learn these new skills, this creates an opportunity for them to connect with their own church communities. They will be equipped to work with their schools and churches, creating advertising material and digital media content to promote the church’s or school’s mission. Developing this online media training through West Coast Adventist School, with the hope that it will be implemented across BC next school year, will multiply media engineers and designers to network within their local churches, schools and the BC Conference. What an opportunity this will be to engage our young people all over BC to further God’s work.